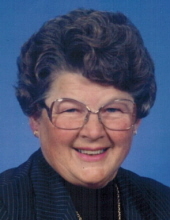 Lois D. Wilder, 91 of Minburn, passed away Wednesday, April 10, 2019 at Lakeside Assisted Living in Panora. Funeral services will be held at 1:00 pm Saturday, April 13, 2019 at Washington Chapel Church of Christ in Minburn with burial following at Elmwood Cemetery near Minburn. Family will greet friends Friday, April 12th from 5:00-7:00 pm at Caldwell Parrish Funeral Home – McCalley Chapel in Adel. Lois was born in Ogden, Iowa on February 2, 1928 to James and Merle (Morgan) Swain. Lois married Harry Bice on June 1, 1947; Homer Smith in 1984 and then Kenneth Wilder on July 26, 1997. She was a was a stay at home mom and grandma until she started working at the Perry Lutheran Home in 1972 and later the Dallas County Care Facility and Spurgeon Manor in Dallas Center. She retired from working outside the home and enjoyed her retirement, spending time with her children and grandchildren. She was a longtime member of the Washington Chapel Church of Christ in Minburn. She is survived by her husband, Kenneth Wilder; siblings, Carroll (Chan) Swain, of Chapin, SC and Marjorie McClatchey, of Linn Grove; children, Thomas (Jackie) Bice, of Adel, and Kathy Bice, of Minburn; grandchildren, Todd Bice, Grimes, Hannah (Keith) Ketcham, St. Charles, MO, Katelyn Bice (Mike Rooney) Seattle, WA, Butch Culp, Witchita, KS, Steve (Bernie) Culp, Ogden, James (Ashley) Culp, Waukee, Scott (Amy) Culp, Adel, Jill Bice, Perry, Jeremy (Casey) Samples, Savannah, MO, Rhonda (Tom) Wilson, Winchester, KS; and 23 great grandchildren. Lois was preceded in death by her parents, Harold and Merle Swain; two husbands, Harry Bice and Homer Smith; son, Jeffery Bice; and sister, Lila Phyllis. To send flowers or a remembrance gift to the family of Lois D. Wilder, please visit our Tribute Store. "Email Address" would like to share the life celebration of Lois D. Wilder. Click on the "link" to go to share a favorite memory or leave a condolence message for the family.